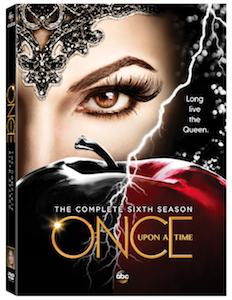 Ginnifer Goodwin as Snow White/Mary Margaret Blanchard; Jennifer Morrison as Emma Swan; Lana Parrilla as Evil Queen/Regina Mills; Josh Dallas as Prince Charming/David Nolan; Emilie de Ravin as Belle French/Lacey; Colin O’Donoghue as Captain Hook/Killian Jones; Jared S. Gilmore as Peter Pan/Henry Mills; Rebecca Mader as Zelena/Wicked Witch of the West; and Robert Carlyle as Rumplestiltskin/Mr. Gold. Performing medical miracles on a daily basis makes the surgeons of Grey Sloan Memorial consider themselves a breed apart from mere mortals. However, what works in the O.R. doesn’t always cut it in the “real world.” And when the gloves and scrubs come off, they often find that fixing their own chaotic lives takes a lot more than neatly tied sutures. 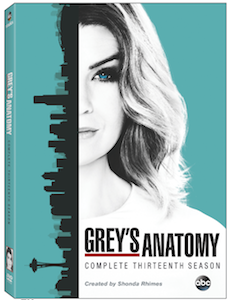 Experience all the turbulent passion and gripping drama of ABC’s Grey’s Anatomy: The Complete Thirteenth Season. Bonus features include Deleted Scenes and Bloopers. After being on her own for some time, Meredith is beginning to explore the idea of a romance with Riggs. Unfortunately, Maggie desires him as well, which threatens to drive a bitter wedge between the sisters. At the same time, despite their differences, Jackson and April must come together when they are assigned a difficult case. Meanwhile, Alex faces the consequences of his vicious attack on DeLuca, Owen and Amelia’s marriage implodes and a hospital-wide mutiny erupts when Bailey demotes Webber. Finally, Arizona may have found love again – but is she sleeping with the enemy? Savor every jaw-dropping twist and turn of the must-own thirteenth season with this 24-episode collection. Plus, go behind the scenes with captivating bonus features that delve deeper into the habit-forming obsession that is Grey’s Anatomy. Ellen Pompeo as Meredith Grey; Justin Chambers as Alex Karev; Chandra Wilson as Miranda Bailey; James Pickens, Jr. as Richard Webber; Kevin McKidd as Owen Hunt; Jessica Capshaw as Arizona Robbins; Jesse Williams as Jackson Avery; Sarah Drew as April Kepner; Caterina Scorsone as Amelia Shepherd; Camilla Luddington as Josephine “Jo” Wilson; Jerrika Hinton as Stephanie Edwards; Kelly McCreary as Margaret “Maggie” Pierce; Jason George as Ben Warren; Martin Henderson as Dr. Nathan Riggs; and Giacomo Gianniotti as Dr. Andrew DeLuca. Grey’s Anatomy was created and is executive-produced by Shonda Rhimes (Scandal, Private Practice, Introducing Dorothy Dandridge). Betsy Beers (Scandal, Private Practice, Casanova), Mark Gordon (Saving Private Ryan), Rob Corn (Chicago Hope), William Harper, Stacy McKee and Zoanne Clack are executive producers. Grey’s Anatomy is an ABC Studios production. IN STITCHES (Bloopers) – Check out the cast cutting up in and out of the O.R. In ABC’s Designated Survivor, Emmy® Award-winning actor Kiefer Sutherland stars as Tom Kirkman, a lower-level cabinet member who is suddenly appointed President of the United States after a catastrophic attack on the U.S. Capitol during the State of the Union. In Season One of this dramatic thriller, Kirkman struggles to keep the country and his own family from falling apart, while navigating the highly-volatile political arena, all while leading the search to find who is responsible for the attack. Bonus features include President Kirkman’s Complete First Speech, Designated Survivor Debrief and Secret Service Set Tour. Experience every edge-of-your-seat moment with all 21 riveting episodes – plus bonus features that draw you deeper into the intricate web of intrigue that is Designated Survivor. Kiefer Sutherland as Tom Kirkman; Natascha McElhone as Alex Kirkman; Adan Canto as Aaron Shore; Italia Ricci as Emily Rhodes; LaMonica Garrett as Mike Ritter; Kal Penn as Seth Wright; and Maggie Q as Hannah Wells. Simon Kinberg, Mark Gordon, Jon Harmon Feldman, Jeff Melvoin, Nick Pepper, Suzan Bymel, Aditya Sood and Kiefer Sutherland. PRESIDENT KIRKMAN’S COMPLETE FIRST SPEECH – Experience the historic full speech given by the freshly sworn-in U.S. president following the terror attack on the U.S. Capitol. 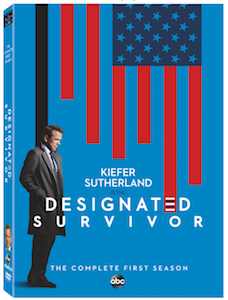 DESIGNATED SURVIVOR DEBRIEF – Go behind the scenes with the filmmakers and cast to discover what it takes to bring this world to life each week, from the Capitol’s destruction and other memorable moments, to how they assure authenticity in the White House, and much more. SECRET SERVICE SET TOUR – Join LaMonica Garrett (“Mike Ritter”) for an intimate tour of the White House sets, including fascinating facts about their real-world counterparts, personal tales of visiting the true White House – and which set-couch is best for a quick nap between takes.